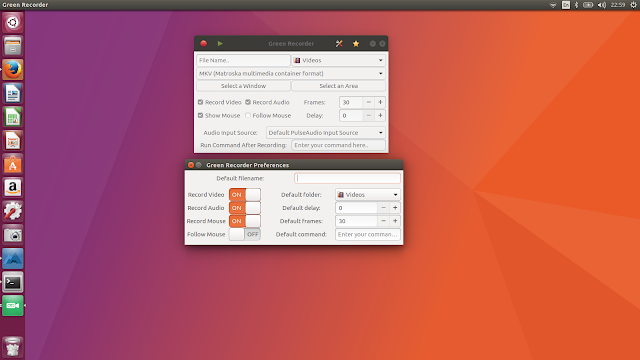 Screen Recorder is a simple desktop recorder for Linux systems. Built using Python, GTK+ 3 and ffmpeg. It supports recording audio and video on almost all Linux interfaces. Also, Green Recorder is the first desktop program to support Wayland display server on GNOME session. It uses the D-Bus API to connect to the built-in screencasting tool in GNOME Shell. It uses this to record video. To record audio, it launches an instance of ffmpeg in the background. After the recording is finished, it merges the two files into the WebM file. Also, for GIF format, Green Recorder first records the required video as a raw video. And then it generated the GIF image from the raw video. In this way, you'll get an optimized GIF image size which is at least 10x better than the normal ffmpeg recording.